Due to another event happening at the normal Little League field, Matthew’s game on Saturday was moved to a different time at a back up field. All three of my assistant coaches could not make the game because of prior commitments. One of the other fathers on the team happens to be a coach for a tee-ball team as well as the league’s safety officer. He also happens to be an EMT. I’ll call him JM. I asked JM if he could help me out for the game and he happily agreed. As we begin our game, I notice Ben wandering around the field, talking to a couple of other kids and staying out of trouble. So I returned my attention to positioning my team on the field. A few minutes later, I heard a scream from Ben that still echos in my head and makes my stomach drop. He keeps yelling “DADDY!” at the top of his voice and I start running towards him, as he holds his arm high. I could see his arm even from 50 feet away and I didn’t see any blood, so I assumed he got stung by a bee. A couple of days later one of the other fathers told me he could see in my face the moment I realized it wasn’t a bee sting. He said he could see in my face the sudden realization that this was much more serious than a bee sting. Ben’s arm was ripped open and I could see…well, I could see way too much that is not suppose to see the light of day. And it was reflected on my face. JM got to us a moment later, took one look and very calmly asked his wife to get his paramedic bag out of his car and then proceeded to call 911. As my brain lit on fire, JM calmly began asking Ben questions, cleaning the wound and getting it dressed. In the same calmness that you or I might explain to a kid how to field a ground ball, he explained to Ben how the ambulance is going to arrive and each step that they would take after that. As I sat there helpless, knowing the best thing I could do was to stay out of their way, he and his wife calmly took care of Ben. JM knew exactly what to do as I became confused as to what I should do. Do I leave Matthew with other parents and get in the ambulance with Ben? Do I just pack up the car and meet them at the hospital? In my confusion, I tried to stop the game and send everyone home. After a few moments, I was able to pull myself together a bit and figure out what to do, but it was only because of the calm example that JM was setting. All the other parents were great, as well. 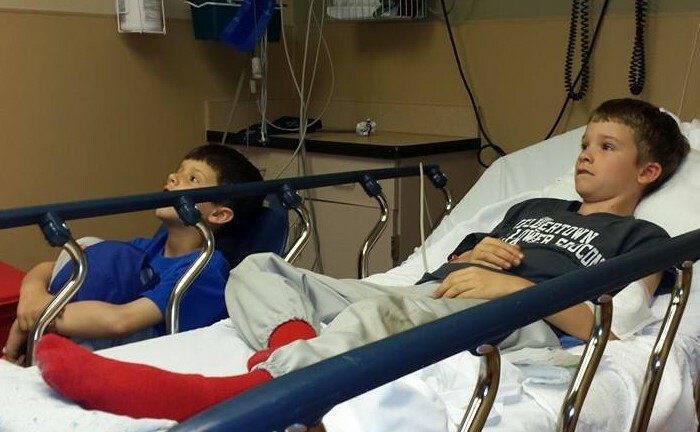 One tended to Matthew as he started crying, afraid for his big brother being loaded into the ambulance and there were multiple offers to watch him for the rest of the day as I went to the hospital. The other dads, I would learn later, pitched in to help the rest of the team finish the game. Offers of help came from all around. The paramedics smiled as they did their jobs professionally and urgently, even sticking around at the hospital for a few minutes to help keep Matthew distracted. One even took Matthew over to get an ice-pop from the nurses’ station. The cop was extremely helpful and patient as he asked me questions and explained what the ambulance was going to do. The doctors were warm and friendly and I cannot say enough about the effort the nurse put in to get Ben to think of other things besides his arm. I am still overwhelmed at the help I received from so many on Saturday. While ultimately Ben’s injury was not that serious (17 stitches and no major damage to any internal tissue or bone), I feel truly blessed by the way so many came together to help me and my sons out that day. However, I keep thinking about JM. Due to his job as an EMT, his responsibilities to the league and the fact that he coaches a team himself, he isn’t always at our games. He misses a few innings here and there. So, I can’t help but wonder how different things may have been that day had he not been there to help. In my confusion, would I have made the wrong decisions? What would I have done had he not been there? As I’ve gotten older, I’ve made my faith more personal and internal. I don’t talk much about my belief in God and how I feel his presence in my life. There have been times when that faith has wavered; I’ve never lost it, but I’ve been mostly silent on it for years. The faith has always been there, though, because of moments like this. It’s a small moment in the grand scheme of things. However, in a somewhat weird culmination of events, JM was there, on that field that day, in a position to use his training and skills to help keep a bad situation from becoming worse. Some would call it a coincidence. As a man of faith, I would call it something very different. Not to mention, everyone that saw his injury remarked that it was a minor miracle that it wasn’t worse. The boy climbed up a rusty chain link fence (in cleats!) and reached over the top to the other side to try to get a grip when his foot slipped. His arm caught the sharp top of the fence. Somehow, he didn’t catch a vein. Somehow, he landed on his feet. Somehow, the muscles in his arm were intact. Somehow, he didn’t break any bones. As a man of faith, I don’t need to ponder the somehow part, I only need to marvel at it. It’s also a matter of faith in other people. From JM all the way to the hospital and all the way to the flood of emails from other parents after the game. So much kindness and help was shown to us that day that it is overwhelming. People are good and kind and I was reminded of that on Saturday. And I’ll always remember and be thankful for JM that day.